SPRING TIME FRONT GARDEN ~ My Welsh Terrier 'Bonsai' surrounded by aubrieta. Some of the comments below are prior to 21st November 2008 when Bonsai went to doggie heaven. Wow this is fabulous, the aubretia is so pretty and Bonsai looks so cuddly, how old is he? Bonsai is 13 years old. I love him far too much. Beautiful plants and an even more beautiful Bonsai. With a beard like that he could stand in for Father Christmas! Arlene ~ Bonsai and I are inseparable. Bonsai is stunning, TT, as is the floral backdrop. which is more than I can! David ~ comments much appreciated. I seem to have mostly springtime flowers. It's nice to see one of your photos Terratoonie. You haven't put many on. Bonsai looks very handsome. You must love him to bits. Your garden looks nice too. I like those colours. They look classy. I really like Aubrieta and other spring flowers. love Aubretia, must get some more especially the red ones....great! I'll pass the message on to Blodyn. Janey ~ Bonsai says Diolch. Ha...ha...Finn says " Hola, bon dia Bonsai"
Bonsai is looking round for a Catalan Sheepdog to translate. I see you haven't had that drink yet. A beautiful boy, you have. A great example of "man's best friend." I am so pleased to see part of your garden with beautiful Aubrieta in it! (and Iberis and Alyssum I think) At last my nagging to see more of your garden is paying off! Are you being deliberately tantalising and only posting one garden photo every 6 weeks to keep us all in suspense? P.S. Henry says 'Hallo' to Bonsai and please will you teach him how to pick up leaves and put them in a trug?. He looks lovely TT. I note that as a Welsh terrier he woofs in fluent Welsh. Mine of course is a staffie. He doesn't woof in dialect but he sure can turn a 20 piece staffordshire tea service into a 500 piece tea service in no time. Are you encouraging your energetic Ed to smash up expensive Staffie tea sets? Obviously enthusiastic Ed is being kept a good distance from your fantastic fish water feature. Don't want any damage to that. I've just consulted my Sheltie, Conker, about leaf-gathering. Conker has his own little plastic rake which he uses for his gardening tricks, and also in his golfing routines, for raking the sand bunkers. Henry, Conker says you could be good with the rake, but, being a Labrador, you would need one with a longer handle. Conker could then show you, not only how to collect up the leaves, but how to parade around with a full trug. Yes, it's true that when dogs can run a lot on pavings etc. this usually keeps their nails short. Has your Shar Pei seen the Sausage Trees uploaded by Delonix1.? If you want to show these amazing trees to Sausage, look on my favourite photos page, down the bottom, near the budgie pictures. Welsh Terriers are on the Kennel Club's list of vulnerable native breeds. It's surprising because they have good temperaments, and are a handy size. Some people seem to find the coat care too much work. I see you found the Sausage Trees. Bonsai says hello to Ladybug. It seems they both agree that black and tan coats are always in fashion! Ladybug is cute. That's a pity she has airway problems. You're sensible not to try any fetch games or tricks. your garden looks lovely as does Bonzai. have you any more dogs that we don't know yet? how do you get them to pose so nicely? when I point the camera at lassie she always runs up to me. I'm pleased you like my front garden. Bonsai and Conker have learnt 'stay'. I have the two dogs, plus Crocus the budgie. That's the total ! We were practising trick routines as usual today. Bonsai pushing his wheelbarrow up and down my lounge, towing a tortoise-on-wheels around rather rapidly, and then digging away on his toy drums. I think that's the old Shetland language. So glad you made it to the bottom of the comments. If you ever feel fit for a marathon, try my GoY Wellie Olympics blog, currently over 250 comments. Lol. So glad you like the colours. Can you grow aubrieta in California, or is the climate too hot ? lol, oh TT you are very funny!!! That's a good one Bonsai! I haven't grown aubrieta before, but I looked it up and it can be grown in this region. I'll have to keep my eyes open for it, yeah the color's great. It's safe to say that I am not in marathon shape, but I will have a look at your infamous Wellie's page :) Have a great day! Looking forward to seeing you over on the Wellie Olympics. You must be fit - the way you rush around taking all those lovely photos! Lovely photo, i love aubretia its so cheering to see it in the spring. I agree. And so does Bonsai. We're happy to see springtime photos any time of year ! What a beautiful flower garden! It is so lush. Thank you. My gardens are always at their best in springtime. Is Bonsai partial to cats, and does he know any Italian so that he can penpal talk to my feline friends ? Bonsai is rather elderly now, but Conker the Sheltie is also very good on the phone ( has several plastic toy phones ) so he will help out by woofing across to Italy. I love your garden and your Bonsai. What an original name for your dog. He is just so beautiful and sitting there so nicely for the picture. I like Aubrieta for its many shades of mauve, red and purple. Thank you for your lovely comments about Bonsai and my garden. Bonsai hasn't been so fit this week. I'm very worried. He is currently at the vets for tests, so fingers crossed for the results. Ah, TT what a lovely little chap Bonsai is. Sorry to hear he's poorly. Hope he soon feels better. Big hug for him. ~love to Bonsai!hope he is feeling better soon! Thanks for your good wishes and hugs. Bonsai's test results show cancer near the liver. Not really an option to do major surgery, but the vet thought Bonsai was also not quite ready to leave us. They were so impressed with his good behaviour, allowing them to examine him etc. Must admit I was proud of my boy. He's always had such an excellent temperament. Mags had liver cancer so have been there.Can't tell you how sorry I am. On the plus side we spoiled him by giving him high protein food like chicken breast,scambled egg etc which he loved!We were told weeks not months by our vet but we had 12 months of which only the last few weeks were difficult when we had to decide what was best for him. Hope you are insured because we did not have cover so had to just cough up and smile for the tests.ops etc- would do it again though if necessary! I have him home. Carried Bonsai back down the path in the photo above. And no, I'm not insured, so that's definitely no new plants this or next year ! You coped very well with Mags. whether it is a cat, dog, guinea pig - all of them. If you want to chat send me a pm~still at home as not quite well yet! Sorry to hear you're still not well. A slug of rum ? seems like a type of which he would approve ! P.S. Bonsai has been enjoying tiny dog-treats dipped in local honey. ~Manuka honey is being used to fight infection in hospitals in Australia and I take a spoonful every day but have run out-must get out to get some more! TT...sorry to hear your news about Bonsai. Any of us who have had pets know this is the hardest part of having them share our lives. Now it's whatever you want, you'll get Bonsai! Thanks. Bonsai is still weak, but very interested in food which is a good sign. ~ hope you and Bonsai have a good nights sleep-everything seems worse when it's dark and your'e awake and don't want to be-time crawls by! Here's hoping for a little bit of sunshine tomorrow!All you can do is take one day at a time. I'm pleased to report that Bonsai seems slightly better this morning. Wobbly on his back legs is my main concern. You and many other GoY members are helping me so much with encouraging and understanding messages, both on comments, and private messages. This support is making these difficult weeks more easy to manage. Thank you. TT - I've just read about Bonsai and wanted to send you a message too. It's so very difficult when pets are so much part of our lives and they love and trust us unconditionally. But keep watching your own strength and health, won't you. I did get some sleep last night after several wakeful nights, so that's progress! Truth is I woke up at 4.15 am. and checked to see how Bonsai was coping. Gave him some little treats dipped in honey, and then looked in on GoY ! The overseas members must think I'm a real night owl ! You're walkway is beautiful. The colors are so cheery! So glad you like this. It always looks its best in springtime. I definitely am. I think plants inspire people to their better natures. And they help with stress. So glad you are enjoying GoY. Yes, gardening is generally good for the soul, and watching plants grow makes us more optimistic for the future. Flcrazy ~ My flower beds have that rather jumbled look of an English Country Garden. Reflects the state of my mind. Lol. Thanks for your thoughts about Bonsai. My dog is called Bonsai. Right now he is he only Bonsai I have ! PS. Looked at your website. Grrrrrreat ! 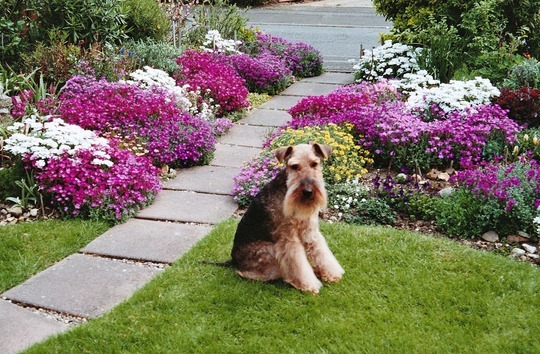 On 21st November 2008, Bonsai the Welsh Terrier went to doggie heaven. Always sad when you lose that special friend. Just try to take consolation from the fact that he obviously had a happy and long life with you. Ed sends doggie love as well. Specials hugs and thanks to Ed. TT, I just want to send my condolences on the loss of your beloved...I lost my Big Dog, Bear, three years ago, and we still can't say his name without getting all misty eyed over him. I needed to get two dogs to take his place! He was a lovely German Shephard, kind hearted and sweet. The good news is that they never really leave you. What they give to the universe is mutliplied over and over and over again in pure love; and with just a thought the love and joy comes back. Such lovely thoughts of how our pets live on in our hearts. Thank you. Nobody can take away the memories of my Bonsai or your Bear. It is two weeks since my special boy departed and I can't yet talk about him face to face with anyone. No wonder you still miss Bear. German Shepherd Dogs are so intelligent, so loyal. I guess you've seen Jacque's White German Shepherd Dog, Summer, on her pages. ? Thanks so much for dropping by to leave condolences. I love the springtime with all the different colours of aubrieta. Are you able to grow that where you live or is it too hot ? Real dog and real flowers. My house is very empty without him. We get so fond of our dogs. Arhhh such a sweetie, i lost my fury friend Buddy AKA the everpresent nostril Oct 07, really miss him. i planted a rose in the garden and scattered his ashes, right in his favorite bone planting spot, so he is still with me when i am out there....also this is a really lovely picture of your garden, would really love to see some more. I'll try to put some more photos of my garden during 2009. There is my photo of "JR" - my Garrya Elliptica - can't recall if you've seen that. Your Buddy sounds like a really special friend. They remain in our hearts and memories. Lovely that you have a rose especially for him. Which rose is it? Is it on your photos ? That's sad, NP, losing such a very young puppy. Interesting Maj, you mention the bird's nest in a Garry Elliptica. My JR, which you can see with all his tassels on my latest photo, is quite near the back of my house, as was yours, and last summer, thrushes chose to make their nest between this and a ceanothus growing alongside. You would adore the new pup "Truffle". I had to see a photo of Bonsai Terra, he was a beautiful dog.